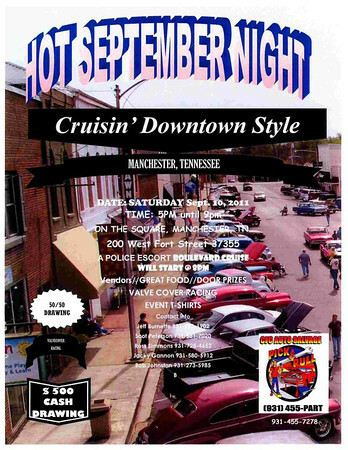 We hope you will join us for the Hot September Night Cruisin' Downtown Style on Saturday, September 10, 2011 from 5 p.m. til 9 p.m. on the historic square in downtown Manchester. There will be door prizes and great food. Music by DJ Steve Smith starts at 4 p.m. Kids will enjoy the Valve Cover Racing. A police escorted Boulevard Cruise starts at 8 p.m. Come early and get a good spot under the shade tree! Make sure you see Mayor Betty at the entrance on Spring Street to register for door prizes. There is no entry fee. A new, unwrapped toy is always appreciated for the Police Department Christmas toy drive. There are also vendors, food, a 50/50 drawing, and a $500 cash drawing. Any event changes or cancellations will be posted on Facebook and the City website. Check us out on Facebook and see the City of Manchester website for more details. Looks like a really fun event! Thank you for the post. Please try to keep us updated if there's any changes.